Prime Minister Theresa May has said it is now time for MPs to decide the way forward on Brexit. In a forthright speech at Downing Street on Wednesday evening Mrs May said that she believed the public "have had enough" of Brexit and that she believed a short extension to June 30 was the way forward. She said that she did not believe a longer extension was the right path as she did not want the UK to be voting in another round of EU Parliament elections, saying the election campaign would be "bitter and divisive". Earlier on Thursday European Council President Donald Tusk said that the EU would be willing to grant a short Brexit extension if Mrs May can get her withdrawal deal through Parliament next week. 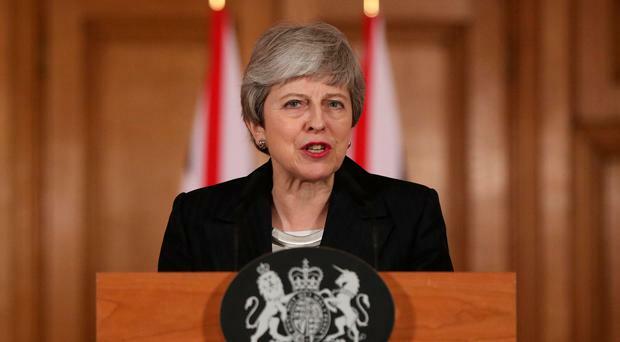 In her short address the Prime Minister said that he still believed her deal was the "best possible" and that she "passionately hoped" MPs would find a way to back it. Mrs May also said that she did not believe a second referendum was the way forward as it could "irreparably damage" confidence in UK politics. She now looks set to try and bring her deal back for a third meaningful vote next week, despite a ruling by Speaker John Bercow that it must be changed before it can be voted on again. Mrs May will travel to Brussels on Thursday to make a formal request to the other 27 EU leaders for an extension to the two-year Article 50 negotiation process. The Prime Minister said that it was a matter of "deep personal regret" that the UK would not leave the EU on time with a deal on March 29. "Of this I am sure, you the public have had enough, you are tired of the infighting, tired of political games and arcane political rows, tired of MPs talking about nothing else but Brexit when you have real concerns," Mrs May said. "You want this stage of the Brexit process to be over and done with and I agree, I am on your side. It is now time for MPs to decide." "Today I have written to European Council President Donald Tusk to request a short extension to Article 50 to give MPs time to make a final choice. Do they want to leave the EU with a deal that delivers on the result of the referendum? Do they want to leave without a deal or do they not want to leave at all, potentially causing irreparable damage to public trust?" Mrs May said that Parliament had failed to be decisive throughout the Brexit process. "It is high time we made a decision. So far Parliament has done everything possible to avoid making a choice. All MPs have been willing to say is what they don't want," she said. The Prime Minister said that she would work "day and night" to try and convince her own party, the DUP, and others to support her deal but was "not willing to delay (Brexit) later than June 30". Speaking after talking to Mrs May on Wednesday evening, Labour leader Jeremy Corbyn said a new Brexit strategy was needed. "The Prime Minister has shown tonight she is in complete denial about the scale of the crisis we are facing and unable to offer the leadership the country needs," he said. "To continue to bring back her damaging and twice rejected deal without significant changes, while threatening a no deal outcome ruled out by MPs, is unacceptable and reckless. "I made clear to the Prime Minister tonight that we must move immediately to agree a compromise alternative that supports jobs and living standards, can win the support of parliament, be negotiated with the EU and bring the country together."